"Star Road Test. Ford Fiesta S"
One of the most important cars of the year, the Ford Fiesta is new by name, and (for Ford) new by nature. Its front wheel drive configuration helps endow the car with good accommodation and safe handling. But its refinement and ride are not as good as some rivals. THERE WAS a time, and not very long ago, that the conventional small family car was a three-box two-door saloon with the engine mounted in the front and driving the rear wheels. Not any more. Today's new small car is almost invariably a three-door hatchback, and more and more manufacturers are combining the versatility that this layout gives with the proven space-saving advantages of a transverse engine/front-wheel drive configuration. The latest of this breed, the Ford Fiesta, is one of the most important new cars for some time, since not only does it mean that Ford have a machine sufficiently small to appeal to a new sector of the buying public, but it also marks their first major departure (leaving aside some indifferent fwd models produced by Ford of Germany) from the hitherto conventional car. When Ford make as significant a change in design philosophy as this, others sit up and take notice. 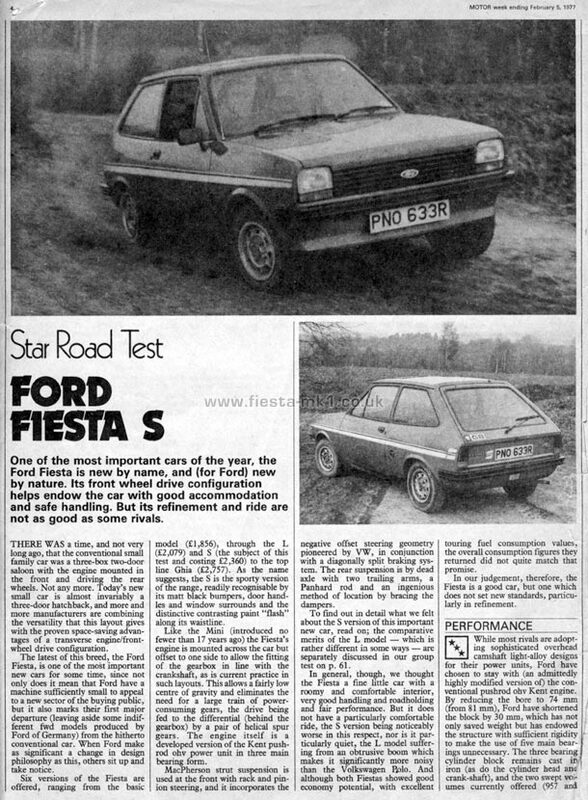 Six versions of the Fiesta are offered, ranging from the basic model (£1,856), through the L (£2,079) and S (the subject of this test and costing £2,360) to the top line Ghia (£2,757). As the name suggests, the S is the sporty version of the range, readily recognisable by its matt black bumpers, door handles and window surrounds and the distinctive contrasting paint "flash" along its waistline. Like the Mini (introduced no fewer than 17 years ago) the Fiesta's engine is mounted across the car but offset to one side to allow the fitting of the gearbox in line with the crankshaft, as is current practice in such layouts. This allows a fairly low centre of gravity and eliminates the need for a large train of power-consuming gears, the drive being fed to the differential (behind the gearbox) by a pair of helical spur gears. The engine itself is a developed version of the Kent push-rod ohv power unit in three main bearing form. MacPherson strut suspension is used at the front with rack and pinion steering, and it incorporates the negative offset steering geometry pioneered by VW, in conjunction with a diagonally split braking system. The rear suspension is by dead axle with two trailing arms, a Panhard rod and an ingenious method of location by bracing the dampers. To find out in detail what we felt about the S version of this important new car, read on; the comparative merits of the L model - which is rather different in some ways - are separately discussed in our group test on p. 61. In general, though, we thought the Fiesta a fine little car with a roomy and comfortable interior, very good handling and roadholding and fair performance. But it does not have a particularly comfortable ride, the S version being noticeably worse in this respect, nor is it particularly quiet, the L model suffering from an obtrusive boom which makes it significantly more noisy than the Volkswagen Rplo. And although both Fiestas showed good economy potential, with excellent touring fuel consumption values, the overall consumption figures they returned did not quite match that promise. In our judgement, therefore, the Fiesta is a good car, but one which does not set new standards, particularly in refinement.